The Denver Broncos are favored by the most points ever this coming week when they host the Jacksonville Jaguars (28 points) and the majority of all hype these days is on Peyton Manning and Broncos. This is not without reason, as Manning is on a historic path for many all time records and the Broncos have won 16 consecutive regular season games. It is hard to believe that just 51 weeks ago (when that streak began), the Broncos and Manning seemed in trouble. Manning was coming off a full season missed due to an injury some thought would finish his career and he hadn’t played particularly well as the Broncos started 2012 with a 2-3 record. Further, they were down 24-0 at halftime of a Monday Night contest against rivals San Diego. 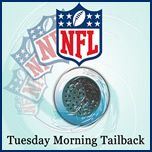 Below is the Tuesday Morning Tailback article from October 16, 2012 after Manning led an unbelievable comeback. Peyton Manning is not done. This is a refreshing statement to say because as recent as 10:00 last night, I was thinking that he might be so. At that point, the Denver Broncos went into the locker at halftime down 24-0, despite the fact that they were statistically even with the San Diego Chargers on offense. That first half was not so much brutal as it was ugly. The Broncos fumbled inside their own 20 on consecutive punt and kickoff returns, giving the Chargers an easy 10 points right from the top. Even when the Broncos seemed to start getting things rolling in the 2nd quarter, it appeared it just wasn’t their night. Manning hit a wide open Eric Decker, who had a clear path to the end zone but tripped over his own feet on the 30-yard-line and two plays later a missed audible led to a “pick six” in the other direction and what should have been a 10-7 game was suddenly 17-0. The Chargers put together their only real drive right before the half, capped by an Antonio Gates TD with 24 seconds left. It was around this point that I noticed the PA at Qualcomm Stadium adopted the famous “Go Chargers” call by former governor Arnold Schwarzeneggar to fire up the crowd on critical downs. It was repeated so many times that it reminded me of the action figure my son had of Schwarzeneggar’s “Terminator”, which constantly repeated the famous line “I’ll Be Back” when he pressed a button. With a 24-0 lead it certainly appeared that San Diego would cruise to victory and be in firm control of the AFC West division. Even though the Broncos had 2 timeouts remaining, Manning knelt down to bring the game to the half and seemed to symbolize the Broncos conceding defeat. I began to wonder if the aging and recently seriously-injured Manning just didn’t half enough in the tank to overcome such adversity. Nine years ago in a similar situation – a Monday night game on the road – Manning and his Indianapolis Colts overcame a 21 point deficit in the fourth quarter. But those days seemed long gone at around 10:00 last night night. 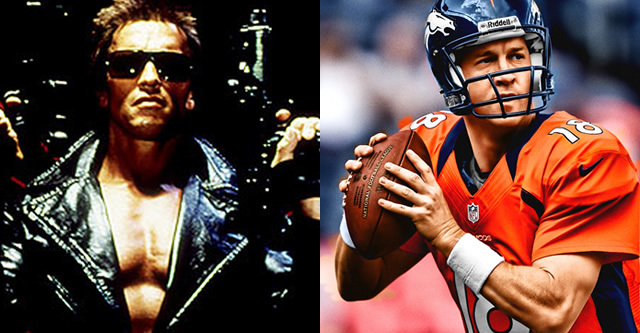 Little did I or anyone else know, Manning was really thinking “I’ll Be Back”. A completely different quarterback and a completely different team came out in the second half. Right off the bat, Manning drove the team 85 yards in about 4 minutes for their first score and this seemed to wake up the entire team, especially the defense. On the Chargers first drive of the second half, Elvis Dumervil caused quarterback Philip Rivers to fumble and it was returned by Tony Carter 65 yards for another Bronco touchdown. 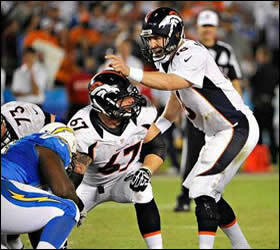 Suddenly it was 24-14 and, even though the Broncos were still down by ten, it felt like momentum had completely shifted. The fourth quarter started with the Broncos defense once again shutting down Rivers and the Chargers offense followed by Manning once again leading the team down the field for yet another touchdown and the Broncos within three points. It was now clear to me that the Broncos had absolutely refused to lose this game, so their continued barrage to a 35-24 victory was simply a fait accompli by that point. Just as everything was clicking for the Broncos, it completely fell apart for Rivers, who went on to throw 3 more interceptions and lose another fumble in the fourth quarter (he had a total of 6 turnovers in the game, 2 fumbles and 4 interceptions). Full disclosure, I’m no fan of Philip Rivers and have long felt he is grossly overrated as I pointed out in last year’s article Prince Philip and Rivers was still named an all-pro last season despite throwing 20 interceptions. But his collapse last night was downright sad as he completely shriveled in the heat of the high-pressure moment. Manning’s play was a complete contrast to Rivers, who coming into the game had won 4 of 5 head-to-head matchups against Manning (a stat that ESPN beat to death in the pre game hype). There is no doubt that Peyton still has something left in the tank and if the Broncos could learn how to start games like they finish (they’ve trailed by 20 points or more in 4 of their 6 games this season), then this may be a special season in the Rocky Mountains.